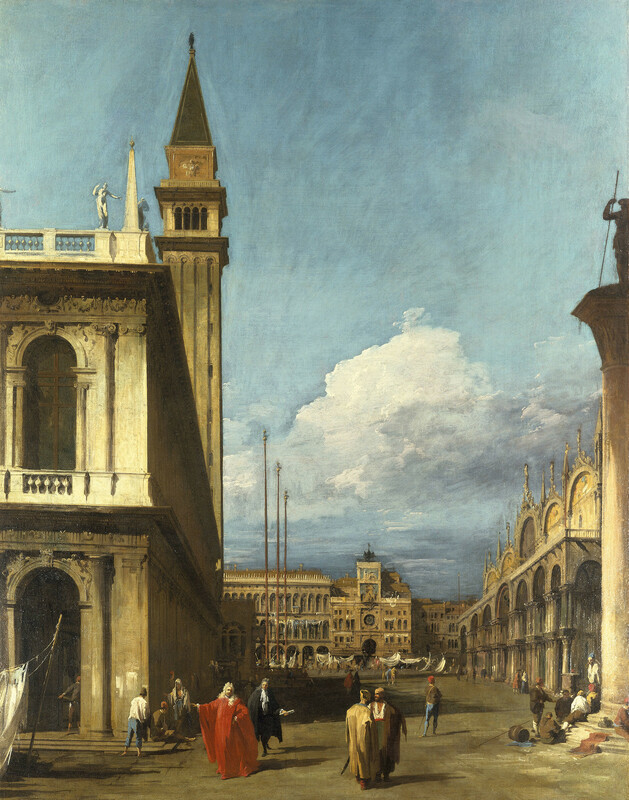 This painting forms one of a set of six views of the Piazza San Marco and the Piazzetta, at the heart of Venice. The series may have been Canaletto's earliest commission from Joseph Smith, British Consul in Venice, who sold his outstanding group of paintings, prints and drawings by the artist to George III in 1762. The set is all of the same size and was probably intended to be incorporated symmetrically into the decoration of a single Venetian room. A closely related preparatory drawing for each view (also in the Royal Collection) may have been the basis for discussion between artist and patron. The care taken over the composition of the architecture and the changes made during the course of painting suggest that the balance and effect of the whole was important to both of them. This work can be considered as a pendant to The Piazzetta looking towards Santa Maria della Salute (RCIN 405073), the latest pair in date of the series. The view here is to the north: to the left is the Liberaria, with the Campanile and the Logetta beyond, and to the right are part of the column of San Teodoro and the façade of San Marco. In the background are the east end of the Procuratie Vecchie, the three flagstands, the Torre dell'Orologio and the buildings along the north side of the Campo Basso. The central tower, the Torre dell'Orologio, is the focal point of any view of the Piazza from the Lagoon. Canaletto rendered the view more dramatic by distorting different elements, including making the Libreria recede at a steeper angle, and making the Campanile tall and slender to avoid overwhelming the Libreria. Moreover, the Torre is seen from the front rather than at an angle, and the three flagpoles recede incorrectly from left to right but add to the dramatic recession towards the Torre. In the preliminary drawing the Libreria recedes more steeply and cuts more deeply into the Campanile, and the Torre dell'Orologio and Procuratie Vecchie are enlarged. Against the massive architecture throwing deep shadows in the afternoon light, the flimsy awnings and small figures, more like cyphers than actual figures, are suggested by grey-black strokes that render them all the more transitory. Posed like an actor on a stage is one of the highest-ranking officers of the Republic, probably a Procurator, dressed in crimson, his stole of office over his left shoulder, with an official in black, document in hand, stepping back deferentially.